Well, for the first blog after the Christmas break when so much packaging around the world has been devoured and disposed of, it seems apt to share an update on the packaging sector for digital printing. Back in December, I attended the Digital Print for Packaging Conference run by Smithers PIRA in Berlin, and it was clear to me that digital print in the packaging sector is certainly making a break for it, and regardless of all the hype surrounding personalised Nutella, Coke and now Nestle's Kit Kat, it has really moved onto another level. What exactly was different to 2016? Well, as the opening presentation made by Sean Smyth captured really well – there is certainly was a greater sense of uncertainty, dissatisfaction, etc. in the world during the year. But regardless of this, digital printing in the packaging sphere seems to have made some strident gains in one year. Sean outlined his theory on the ‘The Uberisation of Digital Printing’. In this, he suggests that the power really is no longer to be found in owning a machine that can print, but rather have a solid and mutually beneficial customer relationship. This is the true value, and this is something we champion at Pure Digital. On the increase is also a demand from brands for late-stage customisation. The need to adapt late on in the process to make your product as relevant and focused as possible. This will continue to develop I think. For packaging, having that flexibility and ability to adapt is really valuable. Additionally, with integrated workflow, the print engine is increasingly easy to use and as a result, we are seeing an increase in web to pack as well as web to print. Sean suggested that the Amazon’s of this world will continue to do this with packaging, just as they already are with book printing. According to Smyth, corrugated printing is growing considerably. And with it, he sees the functionality of packaging printing developing. With this technology, we can tell a story and delight customers and compete with online media. The reality is that super-fast changing consumer behaviour has put the FMCG world into a bit of a spin. 5 years ago we didn’t share on social media our delight of a personalised Kit Kat because Kit Kat didn’t do it, and sharing experiences and personal pictures related to them on social media was less developed. But now, when the link is made between the producers and packaging we see a major change and printing will move up the league table of digital. There is a lot of opportunities out there. Many digital printing advocates and customers are enthused, excited, they are changing, and they are rewriting the rules. They are not sitting there dreading the changing world, as they want to be a key part of it. After Sean had completed his opening keynote, the event content focused on some of the leading brands. And after the first section of content to round off the morning, some very famous brands presented and sat on a panel including AbinBev, Nestle, Coke and Unilever. And the tone of the discussion about digital printing was far more positive and enthusiastic from these brands when compared with the brands who were part of the event just 12 months ago (although they were different people). Back at the 2016 event, the brands seemed insistent that the major issues of digital remained to be the colour reproduction and that digital printing will simply never catch on unless it appeared the same as analogue as well matching if not beating production speed and price. It seemed to me that things had hit a bit of a wall. However, this year revealed an entirely different tone and a far more positive outlook which was refreshing to hear, and also echoed some of the observations we have made with InPrint and which bears out in some of our survey’s and reports. It is no coincidence that the retail sector has radically shifted in this short time. Online retail continues to grow and challenges traditional retail models and early indications in the UK show that fewer people went to the shops for their Christmas shopping once again, as people shifted their spend to online retail. Nowadays, we spend less time food shopping, but we shop more frequently, and mainly for convenience which now has a premium placed upon it. I think large supermarket shopping for food is a rotten experience frankly, and online retailers know this. In fact, Amazon buying Wholefoods represents a significant change as an e-tailer enters traditional retail, and the growth in popularity of Amazon Pantry continues to challenge brick and mortar retail. As a result, the concept of adopting new technologies has become more of a strategic issue, and not a merely tactical, cost-saving exercise. The feedback from the brands was no longer ‘if’ digital printing happens, they were talking as if it is already happening. So the question now seems focused on ‘how to accelerate the growth in the use of digital printing’? 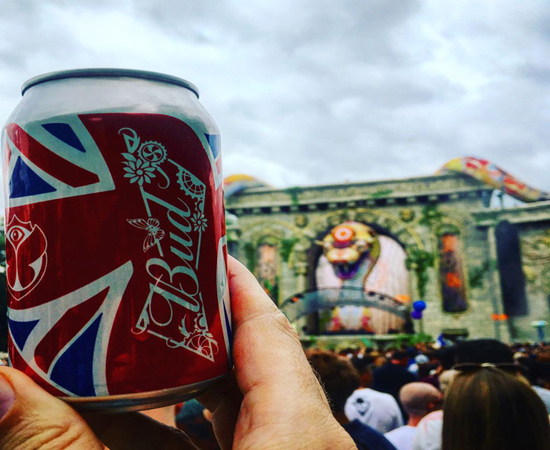 We saw a great presentation from Johan van de Velde from AbinBev, about the work they have done using the Tonejet’s direct to can printing technology for a ‘buzz’ Bud campaign which took place at the dance festival ‘Tomorrowland’, in Belgium which is sponsored by AbinBev. They wanted to create a buzz significant enough for people to remember the Bud experience and to inspire some social media activity. Jan explained that they developed 20 specialist designs on Bud cans featuring 20 different national flags that were then distributed at the event. The run length was small compared with analogue runs, and they ran one design with only 15 units because digital makes this possible. Here, they wanted to showcase the ability for the brand to reach people in a different way. The idea itself came by observing how revellers proudly flew their individual country flags during the festival and using digital printing they were able to play to this by printing them onto the beer can. This is what Johan calls a ‘Buzz’ campaign. And it achieved just that, as people took photos of themselves with their cans at the event and this generated a huge buzz on Facebook and Instagram and many social media channels achieving reach and connecting with existing and new customers in a powerful and unique way. This increase in activity is again partly due to an evolution in the sector. A greater emphasis is now on real-life production from corrugated, cardboard, direct to shape, as well as some flexible applications. One of the new technologies that were presented that really grabbed my attention was Velox, an Israeli digital direct to shape printing technology. Ofer Nir presented Velox as a new business with technology that enables digital printing, but not which is seen as being complementary to analogue – this technology is also designed at a scale to be mass produced. And if this is the case, the introduction of this technology could be truly revolutionary. Designed for use with pharma, cosmetic and cylindrical beverage marketplace, Velox is certainly a company to watch as they develop both the ink and the platform as the ability to mass produce using digital. And this seems to offer something totally different. I asked Ofer a little more about the technology and he explained, "Velox disruptive technology introduces an entirely new approach to digital printing. By developing both the ink and the system architecture from the ground up specifically for mass production direct-to-shape digital printing, Velox changes the rules of the game in rigid container decoration. For the first time ever, a truly industrial solution designed for mass production and not only for short runs. Presenting a breakthrough technology Velox solution provides superior decoration quality and enhancements at a high-volume of production that enables a highly efficient and flexible production process and a significantly lower total cost-of-ownership. Velox is one to watch certainly and we look forward to finding out more in due course. Paul Stoudmann from Bobst then delivered a really refreshing session which offered insight and an honest overview of the challenges both machinery and brand-owners face to integrate a digital process into their packaging supply chain. He started by asking the question: ‘Why is it (digital printing) taking so long’? I have expanded on his session somewhat as I found it to be interesting, not least in that it tackled this question and featured content value and wasn’t an overt sales pitch. Paul began by explaining Bobst is a famous Swiss company who are over 125 years old and active in labels, folding cartons, corrugated & flexible material. So it would be typical to assume that they have a culture of heavy mechanical engineering, which is pretty conservative. Yet little known to most of us, they have over 15 years experience in digital printing. Stoudmann explains they saw the importance of digital printing a long time ago particularly for their core application sectors of flexible, folding, and corrugated packaging. He then asked, what have we learnt? With digital, there are 5 important parameters to consider: Quality, Safety, Seamlessness, Productivity, and Economics. He tackled each one in his presentation and I have attempted to summarise each into a neat subject. For digital printing, the benchmark is analogue and industrial production. Digital needs to match this. The expectation is it that it should be at least as good. First is the resolution. Expectations are that the higher the resolution, the better the quality. It is not just a question of DPI but also depends on pre-coat, primers, ink dot size, frequency. Low res doesn’t always mean bad. Nozzles can go wrong the higher the DPI. In the world of FMCG, brand colours are really important – particularly as most of them were developed with Pantone references which is an analogue metric. Here, he rightly says, we have a problem. Digital printing only uses a limited pallet of 7 inks. So if you want the flexibility, brands need to think extended colour gamuts. In the future, Paul suggests, and I think I agree - new businesses are beginning to use the CMYK range for their brand colours. Increasingly as the knowledge of digital printing expands within the creative industry, designers will know to do this so they avoid the Pantone issue for digital printing. Nonetheless, Paul states that brands really like the fact they are able to benefit from less waste, faster changeover, and shorter run length which are all benefits of using extended colour gamut, in either analogue or digital printing. Of course, customer safety remains a key issue. It takes decades to build a reputation and only two minutes to destroy it by endangering someone’s health. It is non-negotiable particularly with the proximity to food – any new technology which addresses food packaging has to align with this. Recyclability is important as the circular economy is a real thing, so the mix of substrate, ink and chemicals is really important and must meet recycling regulations. The sustainable credentials of a package link directly to the value statement of the brand or product. What do we mean by this? Well, printing is not just an isolated process and you need to forget about everything else. Whatever is printed needs to feed a downstream converting process and so sticking to industrial formats is essential if you do not want to end up having additional tooling costs and inefficiencies. Different substrates which you are able to print by using the same digital technology should be the objective. A homogeneous technology in a packaging plant means fewer approval and compliance protocols, making for more flexible printing, reducing complexity and increasing output potential. The packaging industry has high expectations, and just because it is digital shouldn’t make a difference. What is productivity? Speed is important but not everything: the output of digital should roughly match the input of the downstream converting. Too fast and the logistics needed to manage the inputs and outputs will become a nightmare. But most critical is uptime, which is linked to reliability. This is vitally important since the packaging industry is very unforgiving and disruption to the flow of production is not tolerated. The numbers need to add up. If they don’t, then the project simply will not fly and converters won’t make any money. 2 key elements. The total cost of ownership (TCO) and Capex. But what this means is very much determined on whether the digital application is being driven by Marketing or Production at the Brands. Production-driven digital as a result of brands’ need for efficiency within their supply chain: reductions of waste, obsolescence, lead times, order quantities, all of which impact brands’ working cost of capital. Today these parameters are mostly not measured, not managed and therefore not quantified, making it difficult to justify the use of digital for anything but promotions. What does the future hold? Paul then introduced Mouvent. Many lessons were learnt from the 5 key parameters described above and in July of this year BOBST and Radex founded a new company called Mouvent which is focused on digital print using pioneering digital technology. Mouvent develops, engineers, tests, and industrializes digital printers. It is promising a new standard in inkjet label production cost and quality, and in ink pricing, head durability, quality, and machine performance. The innovative cluster design is the base building block for all systems, current and in development. The MouventTM Cluster represents a completely new approach – using a base cluster arranged in a modular, scalable matrix, instead of having different print bars for different applications and different print widths. Its first ever range of label printing solutions was presented at Labelexpo 2017. Mouvent is another one to watch. There were other good presentations amongst some less interesting sales pitches from some suppliers, and also presentations from HSG Packaging and Sun Automation where genuine progress had been made, as well as The Alexir Partnership, Xerox & Qualvis and Industrial Inkjet Ltd. Overall though, the advancement of digital printing technology in packaging certainly seems to have moved on apace in 12 months. It is possible that this has something to do with the kind of people speaking in the programme – but whether they were more or less positive doesn’t matter, as last year at the conference, and in the early part of the year at other events, and within our packaging survey, there was a general sense of frustration emanating from the technology companies, and a sense of stubborn resistance from the brands represented. I believe that the unstoppable force of the consumer is dictating this step change; by shopping more frequently, for less, whilst demanding experience and entertainment. Any FMCG brand and retailer is fighting to stay relevant, and protecting themselves against the growing force of online retail. It is clear that digital print in packaging clearly has an appealing, and growing role to play and 2018 could be the start of the beginning of the digital print revolution in the packaging sector.